Sonic the Hedgehog is an American comic book series based on Sega's Sonic the Hedgehog video game franchise and the successor of Archie's Sonic the Hedgehog. It is distributed by IDW Publishing. The first issue was released on April 4, 2018, with the first four issues released each week throughout April, followed by a monthly release of subsequent issues starting in May 2018. The comic series was first announced on the official Sonic Twitter on July 21, 2017, just two days after Sega announced the cancellation of the Archie comic series. 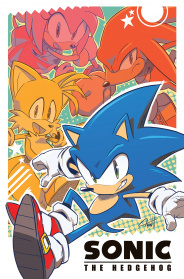 During the New York Comic Con 2017 event, more information regarding the new comic was revealed on promotional flyers (drawn by Tyson Hesse, known for his work on the Archie Sonic comics and Sonic Mania), where it was revealed that the comic will contain characters old and new, and feature brand new stories. Due to legal issues involving lawsuit against Ken Penders, none of the characters that were created for the Archie's Sonic the Hedgehog will be appearing. Over time, it was announced that various writers and artists from the Archie series would return to work on the new comic, including writer Ian Flynn as the lead writer, and artist Tracy Yardley. This page was last edited on 17 March 2018, at 12:49.